Some obvious knitting inspiration there, don’t you think? What has inspired you this week? I’d love to hear all about it! This entry was posted in Uncategorized and tagged Colour, inspiration, knitting, national trust, Pattern. Bookmark the permalink. Beautiful! I thought of you in Aachen Cathedral, where the arches were covered in mosaic, each one different but one like daisies. They were installed in the very early 20th century and seemed to me to be influenced by Arts and Crafts, German-style! Lots of inspiration there, anyway. Coffin Road by Peter May – an exciting thriller, definitely recommend anything by him (Enzo Files set in France (6), China thrillers (6), Hebrides trilogy, standalone “Entry Island” set on the Madeleine Islands/Canada, etc….) and beautifully read by Peter Forbes. 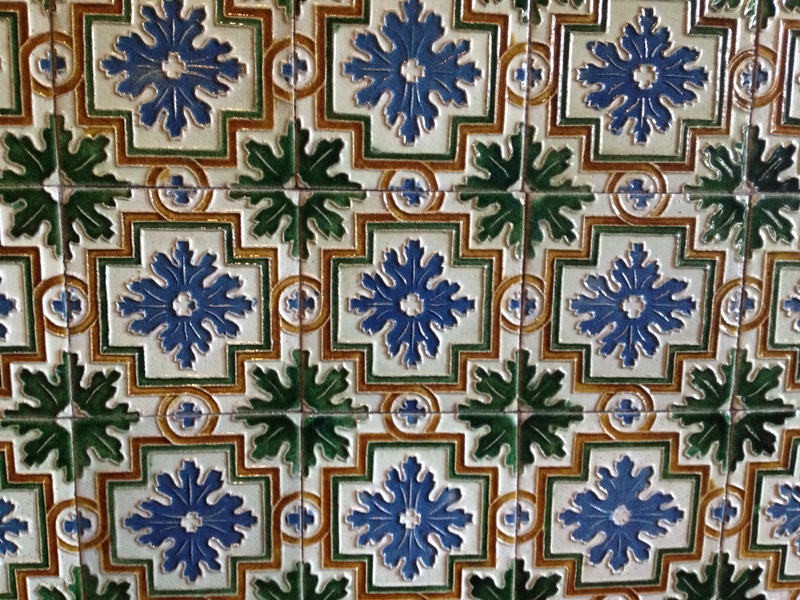 Those are gorgeous tiles. I suppose they were made by hand too. Yes, I imagine they were handmade – I’d love to find out more about them. They were pretty impressive and the corridor was enormous – it must have cost a fortune to decorate it. Beautiful!